Both sides of the abortion debate are watching to see what will happen in Texas, now that Center for Medical Progress investigators have been indicted for exposing Planned Parenthood’s illegal activities. Abortion advocates have been celebrating with supportive tweets, and the Daily Show even held a pep rally. Meanwhile, pro-lifers quickly pointed out the shocking conflict of interest within the prosecutor’s office, as Harris County prosecutor Lauren Reeder sits on the board of directors of the very Planned Parenthood affiliate that was under question. But not everyone falls neatly into the prescribed pro-abortion or pro-life boxes. Even abortion advocates are finding themselves troubled by what a prosecution could potentially mean. Sherry Colb, a law professor and Charles Evans Hughes Scholar at Cornell University, and Michael C. Dorf, a Robert S. Stevens Professor of Law, also at Cornell University, wrote about the potential implications of this case, should the Center for Medical Progress be found guilty. We are pro-choice, and we support the important work of Planned Parenthood, but we find the prosecution of these citizen journalists, however self-styled, deeply disturbing. … [I]t appears the charges arise entirely out of their efforts to deceive Planned Parenthood officials in order to gain access. The felony charge of tampering with government records relates to their alleged use of false IDs, and the misdemeanor charge of attempting to buy fetal remains seemingly overlooks the fact that Daleiden and Merritt were only posing as buyers to expose what they believed was illegal conduct by others. Whatever the precise facts of this case prove to be, the prosecution has broader implications, and not just for abortion and anti-abortion speech. Undercover exposés play a vital role in informing the American public of important facts that would otherwise remain hidden. [W]e…oppose efforts to criminalize undercover investigations, regardless of the investigators’ ultimate motives. What will it mean for the future of undercover investigations if the Center for Medical Progress is found guilty? Will journalists be able to conduct legitimate investigations into potentially illegal activity? As the authors, Sherry Colb and Michael Dorf, point out, this indictment has repercussions that go far beyond the abortion debate. Undercover activists and journalists have uncovered unethical practices at slaughterhouses and laboratories; they have exposed unfair working conditions and medical malpractice. Prosecuting the Center for Medical Progress’s lead investigators could potentially bring all of that to a screeching halt. In addition to this quandary, it will undoubtedly send a chilling message to any future Americans who want to stand up to a large corporation that’s breaking the law. Planned Parenthood receives over half a billion dollars each year in taxpayer funding alone. To call them a behemoth would be an understatement, and the Center for Medical Progress going up against Planned Parenthood is truly a case of David vs. Goliath. Ignoring Planned Parenthood’s almost certainly illegal and unethical practices – while prosecuting the small group that exposed them – sends the message that if an entity is large enough, they can do whatever they want, break whatever laws they don’t like, and suffer no consequences at all. If citizen journalists try to make a difference, and expose the need for justice, they’ll be the ones punished instead. 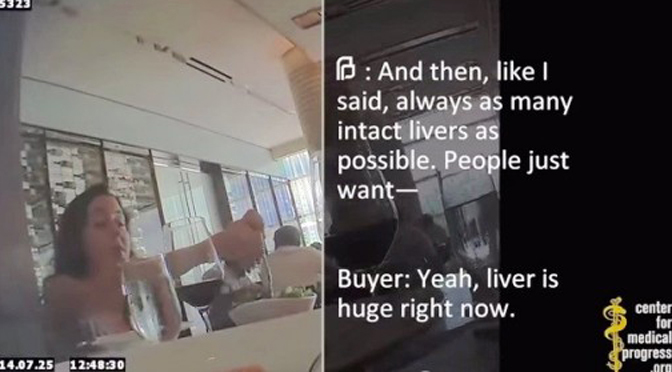 The indictments of David Daleiden and Sandra Merritt gives even more power and influence to mega-corporations like Planned Parenthood, and makes them nearly untouchable. And that is far more worrying than the outcome of this one single case.